The highlighted TI-83 art of today: Mario. 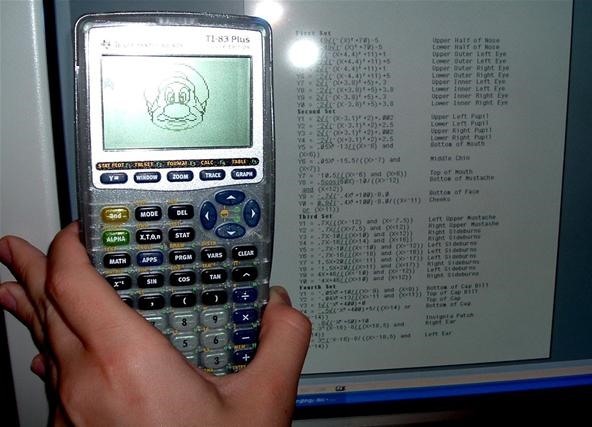 If you're familiar with graphing calculators, you may already be aware of all the Super Mario Brothers games you can play on your TI-83 (available here), but plotting Mario's face in your calculator with just the right functions is perhaps more satisfying than playing all the old 8-bit games. 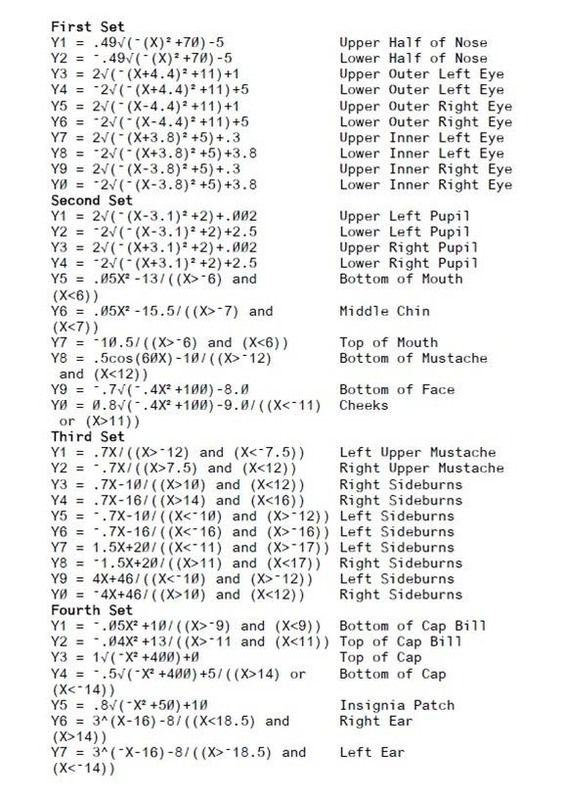 To draw Mario's face in your own calculator, just use the code below (thanks to Redditor kaidance). And if you're curious how this works, Redditor paolog explains the formula: "The formula is one that decodes a number into an image, the image is a simple bit-mapped version of the formula, and the number is obtained by encoding the image." Can you design a more complex image on your TI-83 calculator? What is the setting for the graph window square? i.e. xmax/min, ymax/min and scale? How do I open a differnt set? For those of you who are doing this, for the third set y-6, one the equation is wrong it (x<-14) and (x>-16) haha did this myself, and was like what the heck. How do you enter the comments to the right on each line? My TI-84 calc is running the latest OS from HP but flags these as syntax errors when I enter them. Is this an 83 vs 84 issue...?